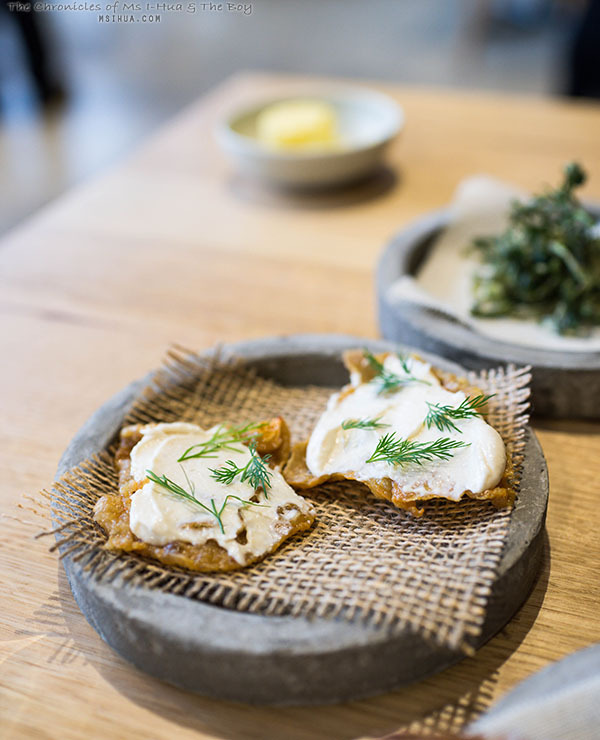 If you’ve been paying attention, you would have noticed that I recently contributed an article to The World’s 50 Best Restaurants blog page on the 5 Must-Visit places to eat and drink on a road trip through Victoria, Australia. If you’ve missed it, here’s the link to the post. One of the places I recommended for the Geelong and Bellarine Peninsula, was Igni. It’s been a while since we’ve been able to have a taste of Aaron Turner’s fine dining food. He closed the popular Loam and left Australia, spending time in Nashville before bringing back Southern Fried Chicken in the form of Belles Hot Chicken to the eager crowds of inner Melbourne. 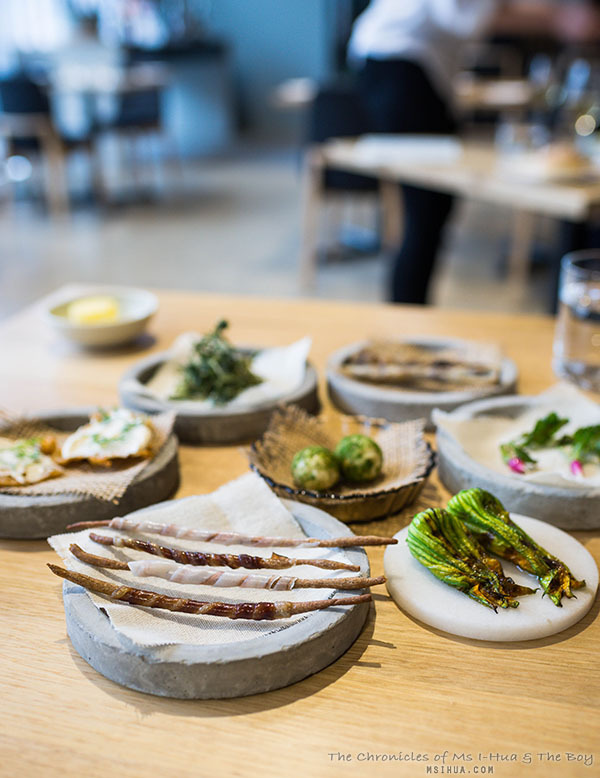 However, since the start of 2016, Turner has returned full force into the finer dining kitchen, moving away from casual food, and away from countryside Victoria (Loam was previously in an olive orchard in Drysdale), and into the City of Geelong. This new location makes it much more convenient for people to visit, and it means that you can catch a regional train to Geelong and have your meal with matched wines and not fear about driving! The location of Igni is in a rather unassuming laneway. 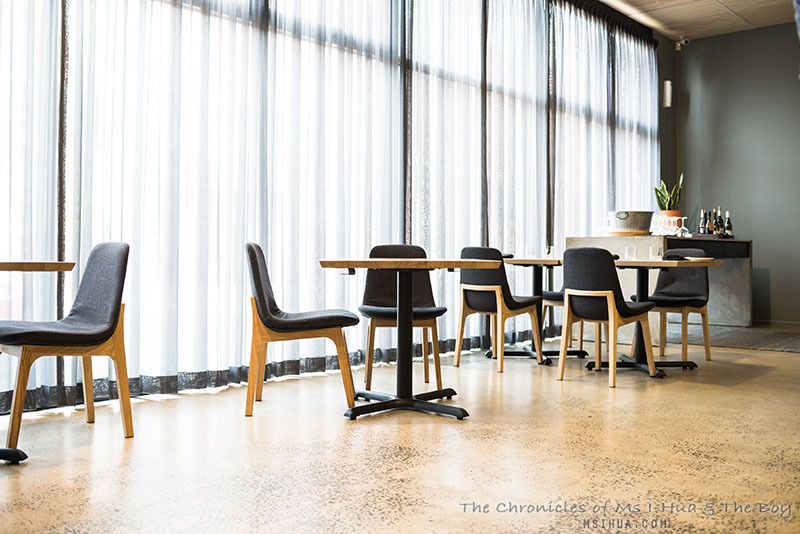 With grey brick walls and grey drapes covering the full length windows of the restaurant, you could easily be forgiven for walking past the restaurant. It’s not until you are on the other side of those grey drapes, that you realised the block-out is only one way and everyone inside can see you walking around cluelessly! As we chatted to familiar faces on memories gained 5 years ago, we were introduced to a selection of snacks to start us off on our tasting menu. There was Zucchini Flowers with pickled mussels; Smoked quails egg rolled in matcha (Japanese green tea); Salt bush leaves deep fried with freeze dried vinegar (totally addictive); Baby breakfast radishes (ala Loam); Rye crostini sticks with cured pork jowl (guanciale) and dry aged duck; Confit duck cigar; and finally, Chicken skin with cod roe. All the snacks were seriously good, but the stand out was certainly the Chicken Skin with Cod Roe. I think I need more of this in my life! 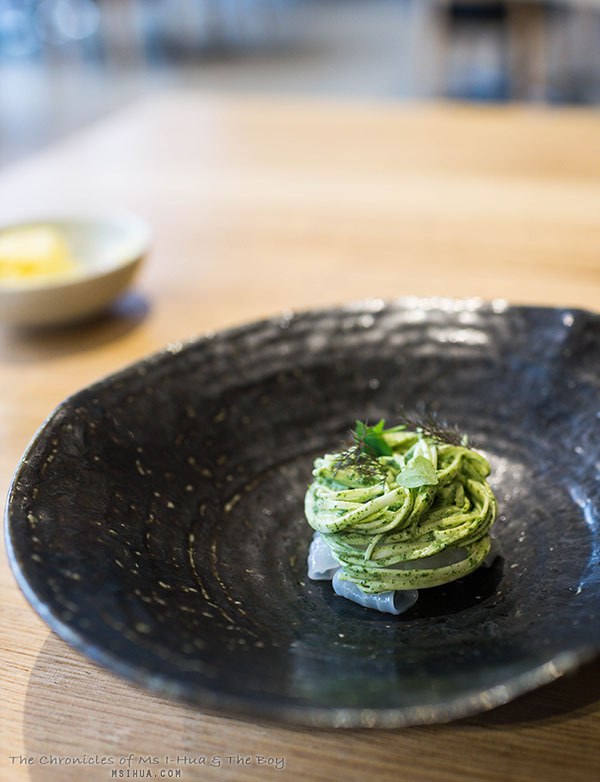 The official tasting began with raw celeriac, lemon emulsion, oxalis, and bronze fennel nesting atop thinly shaved squid. This was simply creamy and refreshing with a great contrast in textures. 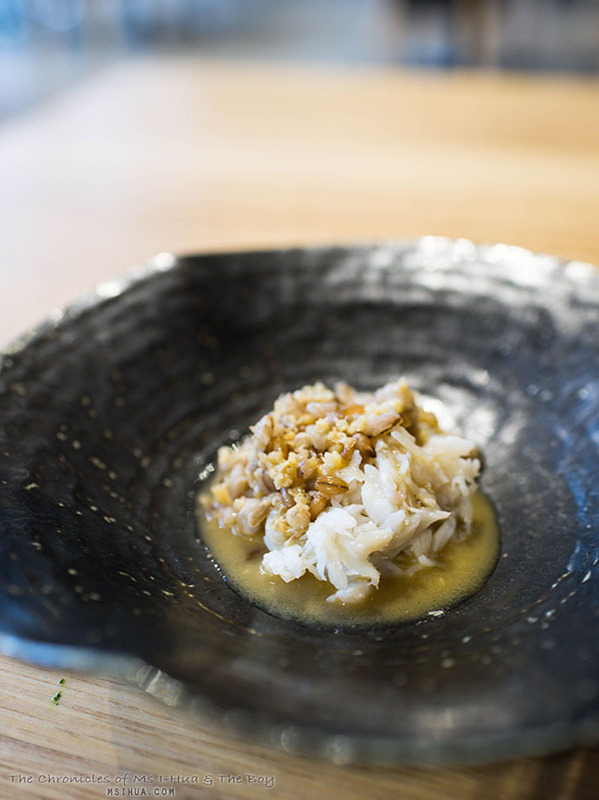 We loved the interplay of textures in this dish as well as the perfectly balanced flavours of saltiness and umami-ness. 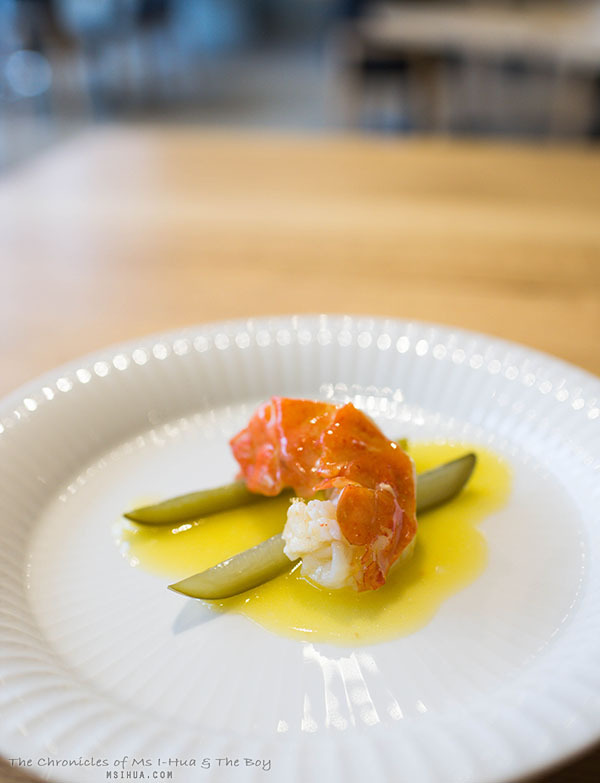 This dish certainly made us think of the Chef’s recent foray into Southern cuisine, with the inclusion of the slightly American-style pickled cucumbers. That being said, the dish was Spanish influenced, with the marron cooked with a Pil Pil, a sauce of Basque origin, usually using olive oil, garlic and chilli. In Igni’s case, it was a butter reduction. Certainly, the colours on the dish were very Español-centric! The most unassuming dish of the day. Plain, boring, bordering on unattractive. 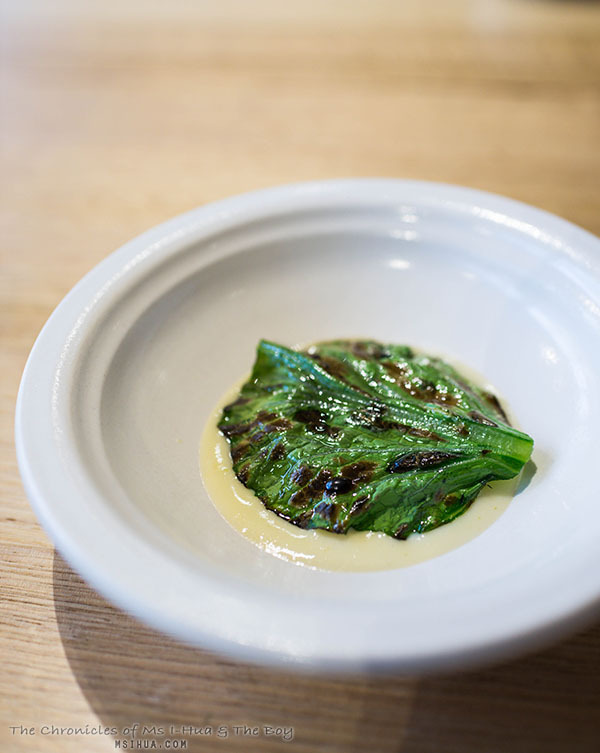 Yet, once the mustard leaf is lifted away and you’ve sliced into the boring looking beet, lo and behold, your senses erupt and your mind is blown. Such was how we felt as we both stopped talking once we placed the beet into our mouths. The Boy proclaimed it the best vegetable dish he’s had so far in 2016! Confit in goose fat, slow roasted on the low girdle, drizzled with thyme oil and finally served with whey mixed with Comté cheese, this was the winning dish of the day. Chef Turner likes to cook with Western Plains pork, and this time it was no different. 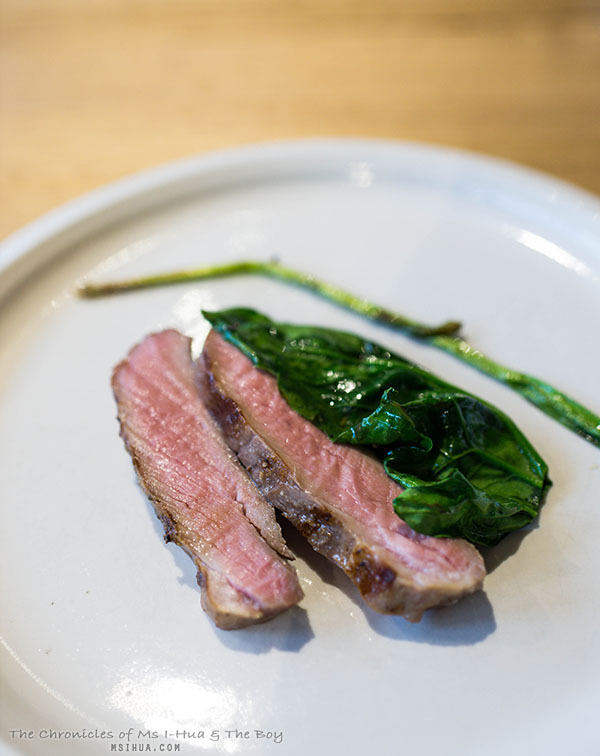 Using the neck of the animal, it was served with wild garlic shoots, garden spinach and a hidden blackened carrot puree. On to the cheese course before desserts were to be served. 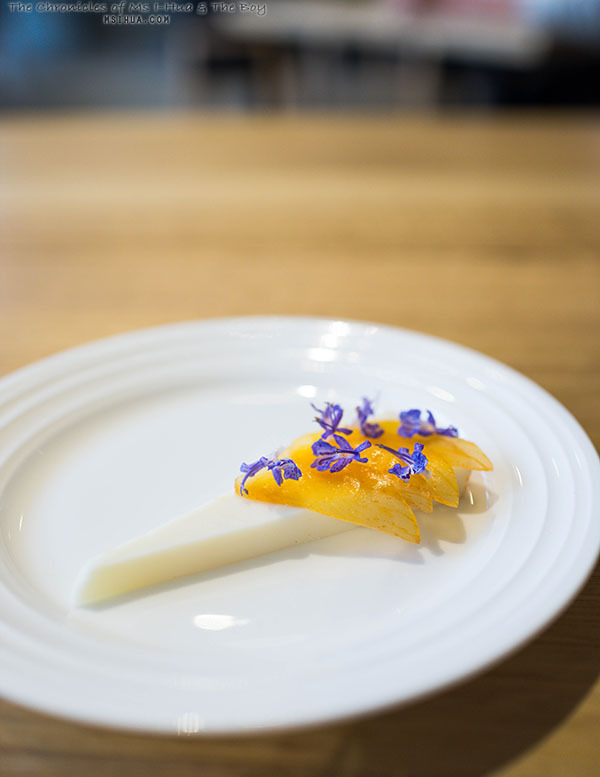 I loved the lightly flavoured Spanish goats cheese (aged 7 months) topped with maple pickled persimmon, and rosemary flowers. It almost looked too pretty to eat. Almost. 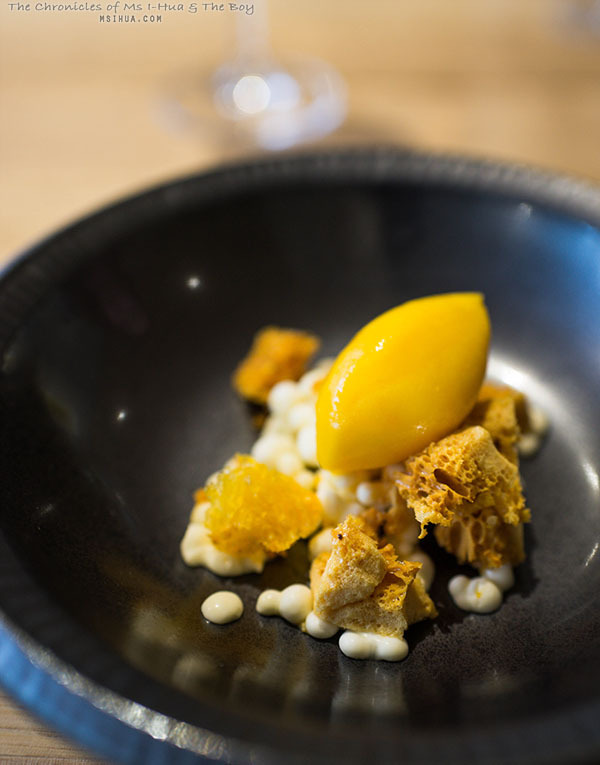 The Mandarin sorbet proved to be a lovely refreshing palate cleanser, topped with honeycomb and dots of cultured cream. Again, another perfectly executed texturally and well balanced dish. 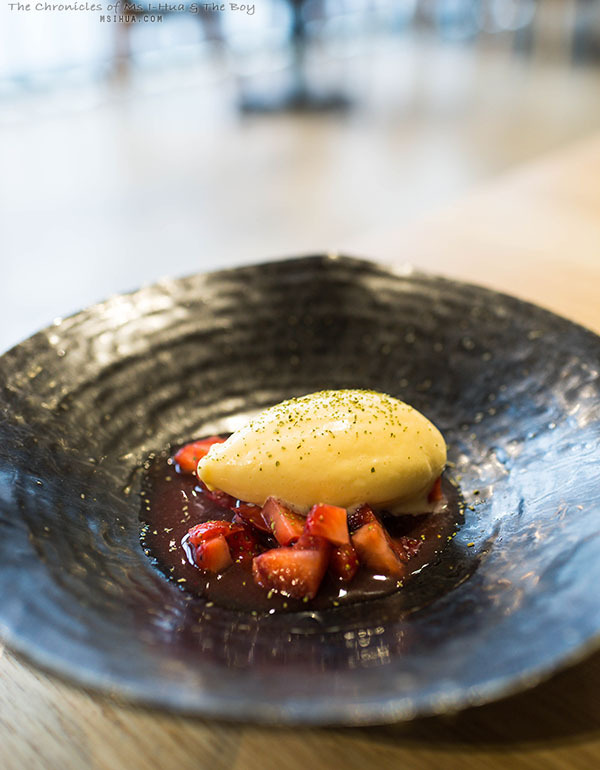 For our eighth and final course, we were served pickled strawberries with a young peppercorn ice-cream topped with shiso. If you hadn’t realised by now, Chef Turner is like the ‘King of Pickles’, using his gift of pickling in almost every dish, all through to dessert, which was a lovely surprise. With the final petite fours being Tangelo Madeleines and Roasted Pineapples, you can be assured that they know how to bade a sweet goodbye! All up, this was a really relaxing and beautiful lunch which managed to make us think about the types of flavour matching and food profiles. It wasn’t challenging in the sense of blowing our minds (apart from that beet dish), but it was certainly thought provoking with the paired ingredients. I know I can’t wait to return to sample the menu for next season, and I am wondering if we should plan it as a weekend away (seeing it’s only about an hour’s drive or train ride from Melbourne).